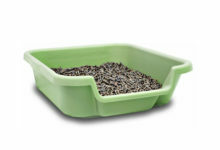 Keep it clean: Keeping your dog’s litter pan clean will make it much more likely that he/she will want to use it. Remember, a dog likes a clean bathroom just like a person would. Do not scold. Instead, praise your dog when he/she exhibits good behaviors. Saying “good dog” and offering a treat will help the dog know he/she has performed well. Keep the relationship between you and your dog positive. This will help ensure long term success. Once your dog is fully trained in the pen, it is time to introduce them to the rest of the home. Keep an eye on your dog when you first let them free to explore their surroundings. If you allow your dog unattended freedom too quickly, you may experience more accidents. You will want to give your dog access to new areas gradually. Remember to reward your dog for good behavior. Watch your dog well to correct their bad behaviors. If you scold your dog after they have done something wrong, they may not remember what they had done. 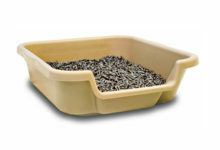 Allow your dog to gain more freedom in your home after you have observed consistently good behaviors.Always make sure your dog has access to the litter pan at all times. Accidents may happen: Don’t get discouraged. Continue with the program and be attentive. 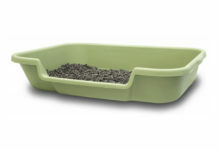 Continue to praise your dog when he/she uses the litter pan. Re read the guide and figure out if you did something different or unusual that could have led to the accident. Staying consistent with the training methods will help ensure continued success. If you see your dog beginning to behave badly, distract your pup by making a loud sound like AAAA! Or make a rattle sound. Praise is so important because a dog looks to their owner as the pack leader. Your dog wants your approval. Until your dog is trust worthy, make sure to watch its behaviors. If you see your dog beginning to behave badly, startle it by saying firmly “AHH”. Then lead your puppy to the litter pan and praise them profusely when they perform as desired. This will turn something negative into something positive, which your dog will respond more effectively to. Scolding, instead of praising your dog may make them think that the litter pan is associated with your disapproval, confusing the dog and leading to more accidents.Staying consistent with praise and treats will have your dog fully trained much faster.